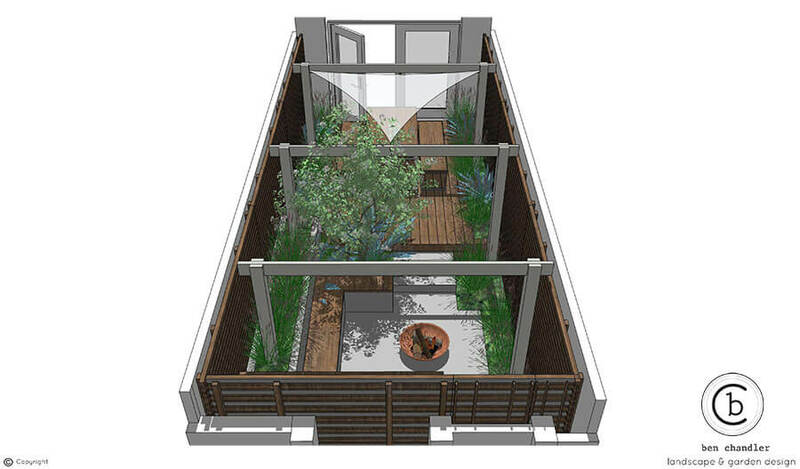 The start of June’s off to a busy start for all of us here at Outdoor Creations, we’re in the midst of a garden build over in Meopham, and have just had a new garden design approved for a build in Wapping, London. Elliptical steps for a home in Meopham. Elliptical steps for a home in Meopham. Elliptical steps for a home in Meopham. The beautiful steps above have been designed by Peter Reader & we have out friends to thank over at London Stone for the bespoke cut the slabs that our team used to create the feature on. These steps and their pale colouring really work well with the brightly coloured door/window frames used for the home. We hope the home owners enjoy this outdoor area over the summer which is right on our door step. Next up we have this city garden design from Ben Chandler. This design has just been approved by the home owners, so we’re looking forward to working on it in the coming months. As you can see this garden features walls all the way round in order to maintain the privacy of residents. Despite the urban setting, this garden embraces nature with trees and plants bordering the area. The fire pit area is on of the few areas in the garden that doesn’t feature wood (of course as a safety precaution). It features a stylish metal fire pit which will stand the test of time and keep the home owners warm for many summer nights to come. For those lovely Summer evenings we have a wooden picnic table where residents and visitors can sit to eat, to provide some shade a shading fabric has been stretched between the support beams, this means people won’t get too hot and might help with some of that unexpected rain we’ve been having.